Vauxhall’s star of Geneva 2016 has landed, and with it the possibility of an affordable production sports car in the not too distant future. The front engined, rear-wheel drive two-seater is being called a “template for future sports cars” by Vauxhall, despite featuring an overall shape and set of door hinges far too complicated for series production. 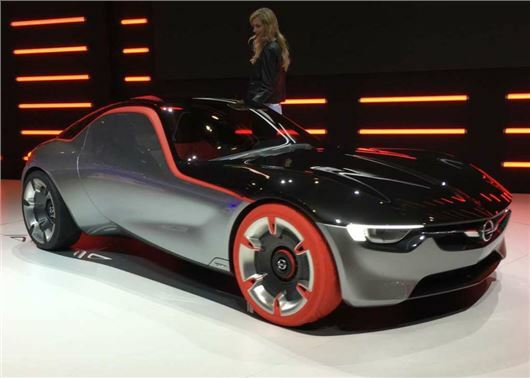 It takes inspiration, says Vauxhall, from the 1965 Opel Experimental GT and the 1966 Vauxhall VXR models, while also being “a logical step on from the Monza concept of 2013,” says the company. Power comes from a 1.0-litre turbo petrol engine with three-cylinders, as found in the Adam, developing 145PS and getting the GT to 62mph in less than eight seconds - largely because it weighs less than a tonne. A sequential transmission with paddle shifters directs power to the rear wheels. The interior is focused on a large touchscreen, and there are no button controls in the cabin at all. The GT recognizes voice commands, and Vauxhall says the software is capable of recognising the driver and his or her preferences, including the sort of music they listen to and their driving style. That means that it will tighten up the suspension and steering on startup if the driver generally has a sportier style, or the opposite of their driving is more relaxed. Don't expect to see that particular feature on a Mokka any time soon.